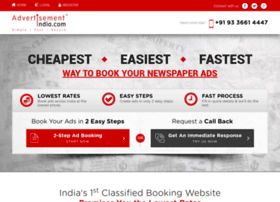 Advertisement India is one of the leading newspaper advertising agency in Delhi, India. We enable you to book online classified ads in any newspaper in Delhi, Mumbai, NCR, Hyderabad, Bangalore for matrimonial, business, property, jobs, obituary etc. Owner: W.Y.S.I.W.Y.G. Advertising Pvt. Ltd.